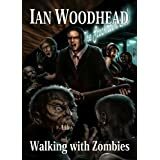 I read the first one, The Unwashed Dead, and thought it was just a fast, fun, no-brainer zombie story that I could get lost in for a few hours. Characters didn’t have depth, but then who cared, I enjoyed the read and this is what mattered. So I went ahead and picked up the second one right away, Walking with Zombies, thinking I’d get another that probably would rate in the same category as the first one. What a thrilling surprise to find that characters were built up to a much higher level in this one. Not only were the characters distinct from one another, but the plot was more developed, even adding a new twist on an old tale. I’m not going to give it away because if you like zombie stories, you’re going to love this! So why only three stars, you ask? As with the first novel, it could have used a couple more rounds of editing before it went to print. If I hadn’t been so caught up in the story, I guarantee you this would have ended up in my “Can’t Finish” list, it’s that bad where grammar and punctuation are concerned. Second reason, and one that almost dropped it down to a two star review, the ending just stopped in mid action, chopped off to begin in the third novel, I guess. Really irritating, but I feel this is something I can’t overlook when giving out a review. Even series novels should have something of a beginning, middle, and end. This one didn’t. Would I still encourage you to read it? You bet. It’s a fun story—if you like zombies and a lot of gore. I’ll probably pick up the next one in line and hope Ian Woodhead can keep up the good work with characters and plot, but this time give me a satisfactory ending. If not he’ll take a big risk in losing me as a loyal fan. Posted by Denna Holm on September 16, 2011 in Archives. The cover is awesomely scary! Not sure I shall give this particular one a go, but I’ll be interested to see how Ian Woodhead develops as a writer.